This is my first post from the road. We flew out of Fort Lauderdale Florida after two days at the beach, convenient you could say, after spending two days sitting on the beach. We all got on our flight out of the U.S. with a tan. One long connection in Stockholm and we touched down in Riga at night. Slept until midday, after spending the early morning hours of the day awake, jet-lag. Visting Riga was not at the top of my list, but Eastern Europe was our destination, and the cheapest flight happened to be to Riga. Actually, most people we told back home where we were going had no clue where Latvia was, so I’ll start with a little background on the city. Riga is the Capital City of Latvia and the largest city in the Baltic Block. More than one-third, 700,000 citizens, of all Latvians, live in and around the city. It was founded in the 11th Century as a base for the Northern Crusades. Almost nothing exists of the city from those days asides from some nondescript stone walls that made up the original harbor. For the first several hundred years, the city went back and forth between Swedish and Russian control, until gaining their Independence in 1918 after the First World War. However, after World War II it fell behind the Iron Curtain and was forgotten largely to American’s and international travel. However, it is now bustling again and seeing a growing number of international tourists, even being made the European Culture Capital for 2014. It is fall in Riga. Day one, we set to explore the Old Town by foot. Had a lunch of Russian Dumplings. The churches are large and made of brick dating back to the 13th century; their distinguishable tops give Riga a distinct skyline. The Old Town was quiet, the tourists thin out by late September. Old Town is largely for the tourist and select few who can afford to live there, leaving the streets empty for the most part. Riga is famous for Art Nouveau architecture and it is visible throughout the old town and surrounding neighborhood. It’s a style of architecture that is all about the facade and it’s evident by the ornamental touches on all of the buildings. We spent some time walking down the cobblestone streets. As the day grew late we explored the central market. It is the largest market in the Baltics and occupies five former zeppelin hangers. Fruits, vegetables, pickles, fish, meat, dairy, and baked goods all have their respective home and can be had at cheap prices. Garlic and dill are in abundance Just don’t try to haggle with the locals, this is not the place for that, just treat it like any other food market. The market runs mostly by older Latvian women who speak little to no English, so you’ll have to go by the old method of hand gestures to grab your goods. On our second night we stocked up on local produce and mushrooms, its foraging season, and made dinner ourselves. As with most European cities, we go to we take the free tour. It’s always helpful giving insight into the locals, history, sites, and tourism itself (Always tip your guide! They need to eat too and are providing you a service for a discount). Riga was no exception we took the free tour here and our guide Martin was animated and helpful. The tour took us through a bit of old town but was quick to pull us out towards the suburbs and show us some of the less popular sites around the city, all within walking distance. The food in Latvia just like almost everywhere is a mix of the region getting things such as smoked fish, roe, plenty of pork, potatoes, dill, rye bread, and dumplings. It’s hearty food and tasty, we all loved the local pickles we got in the market. Most of the restaurants are cheap and affordable too, we had dinner for five euros and lunch for just over three. The people were distinct. In three days, hardly enough to understand any group of people, we saw few smiles and less in the form of kindness. Maybe there was a cloud over our first spot we touched down. I think the frame of mind affects everything and we landed in an area where most people have their guard up. It wasn’t the best start. Most find it difficult getting settled into a long-term trip. I suppose we did too. Riga was interesting; the architecture, food, beer and the culture are indeed worth a visit. This is after all just the beginning and we only just began to dip our toes in. The glory of traveling with no itinerary is when you don’t have the right the vibe you can just more on. I’m writing this now from Lithuania. 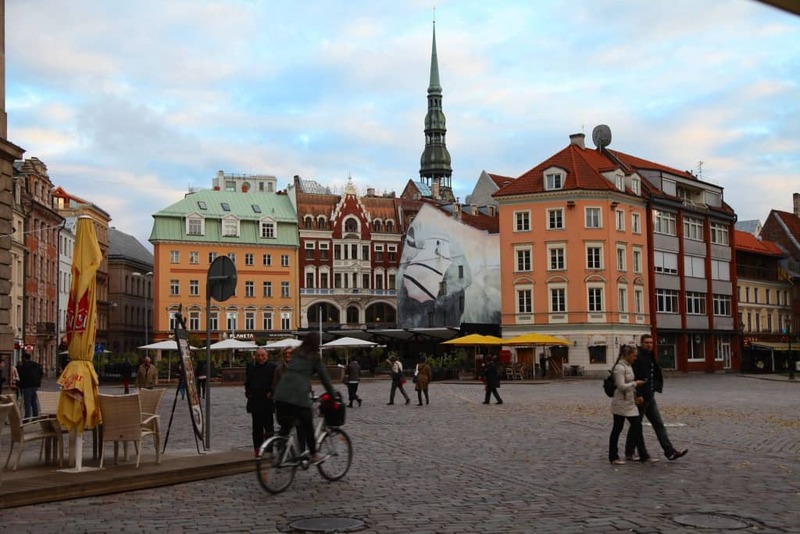 Riga: Is completely walkable so no transport cost asides from the 1 Euro bus ride from airport.